I was sad to hear about the death of Reg Presley yesterday. He always seemed like a nice fella, and aside from anything else you’ve gotta love the way he spent all the cash from that number-one-for-a-million-weeks ‘90s cover version investigating UFOs and lost cities and such. 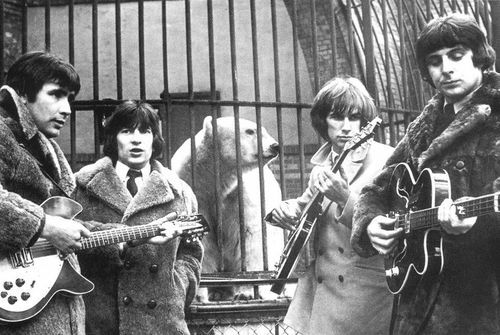 Obviously The Troggs were one of the best and most over-looked psych-thunk, proto-punk, transcendent god-pop beat groups ever – everyone knows that, and if they don’t, they should. From the name on down, they really were the perfect idiot-savant garage band – so good that if they didn’t exist someone would have to invent them. So do I really need any more excuse to post a bunch of Troggs videos to prove the point? No, not really. ‘Night of the Long Grass’ and its accompanying video in particular are personal favourites of mine – just the way it keeps the band’s thug-simplicity intact whilst adding such an amazing sense of atavistic, soul-shivering psychedelic mystery to proceedings (and that’s not something you’d really expect a great deal of from The Troggs based on their three line ‘Virgin Encyclopaedia of Rock’ type summary, right?). Incredible track - I never tire of it. And speaking of atavism, I never really got ‘round to checking out their weird ‘70s heavy metal reinvention. I hear it’s pretty salty. Hmm, maybe we’ll come back to that later. In all respects, nuff said. Rest in peace Reg, for you were once and are forever one of the greats.